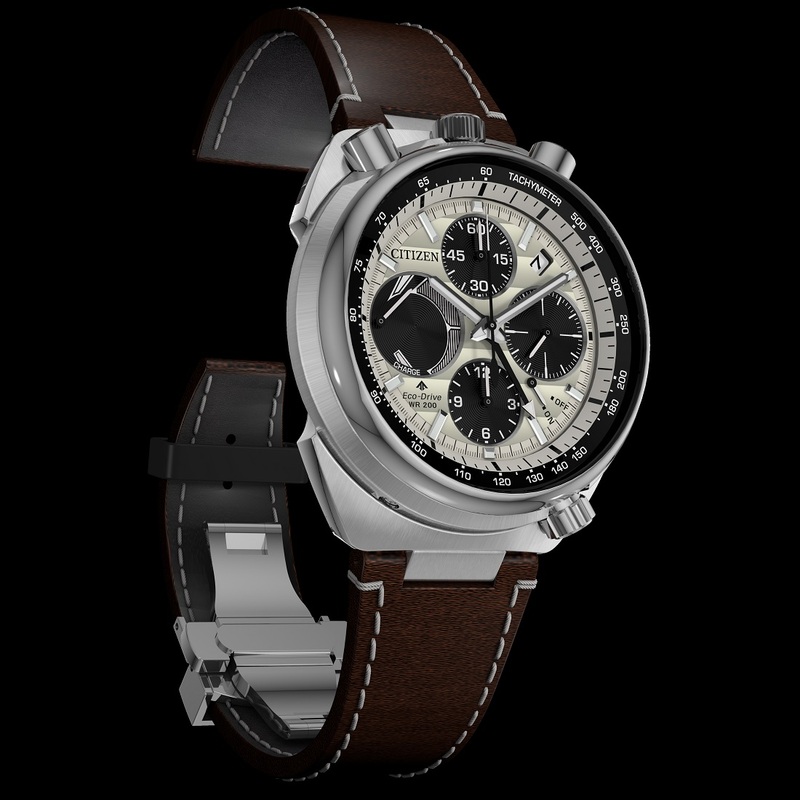 In 1973 Citizen launched the original Tsuno Chrono Challenge Timer, a steel bullhead-style automatic chronograph that would eventually help pave the way for Citizen’s Promaster series. The Challenge Timers were a unique bookmark in Citizen’s history. They also heralded the advent of the Citizen Caliber 8110, a mechanical chronograph caliber that boasted a column wheel, flyback functionality, as well as day/date compilations. 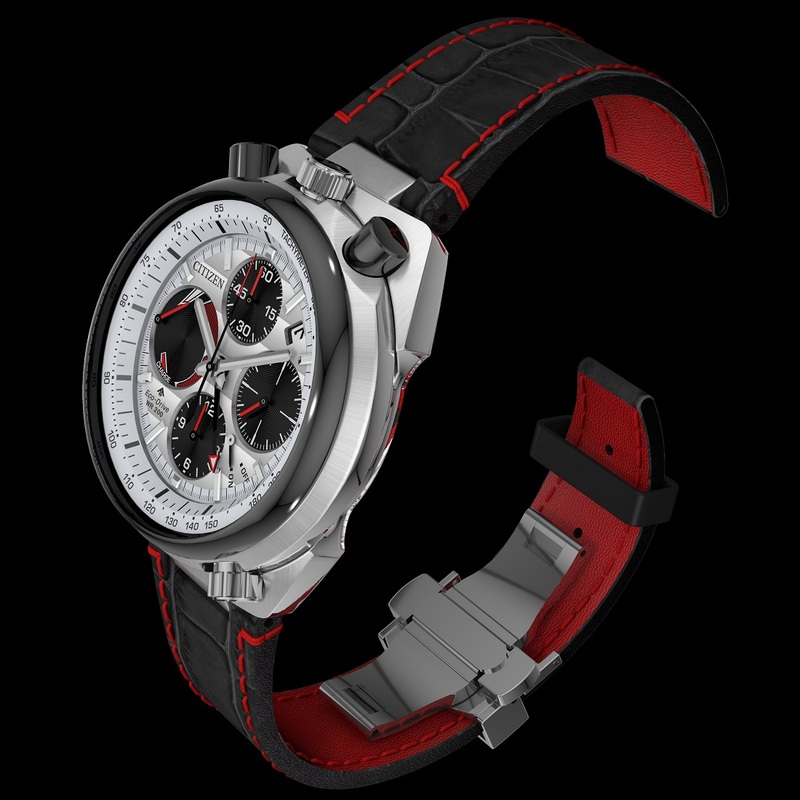 For Baselworld 2018, Citizen is unveiling the Citizen Tsuno Chronograph Racer, a reissue of the classic Challenge Timer. There’s no secret that Citizen’s Japanese rival Seiko has been releasing heritage reissues in a sort of frenzy over the last couple years, but Citizen’s take on it has been conservative, and slightly slower in pace. 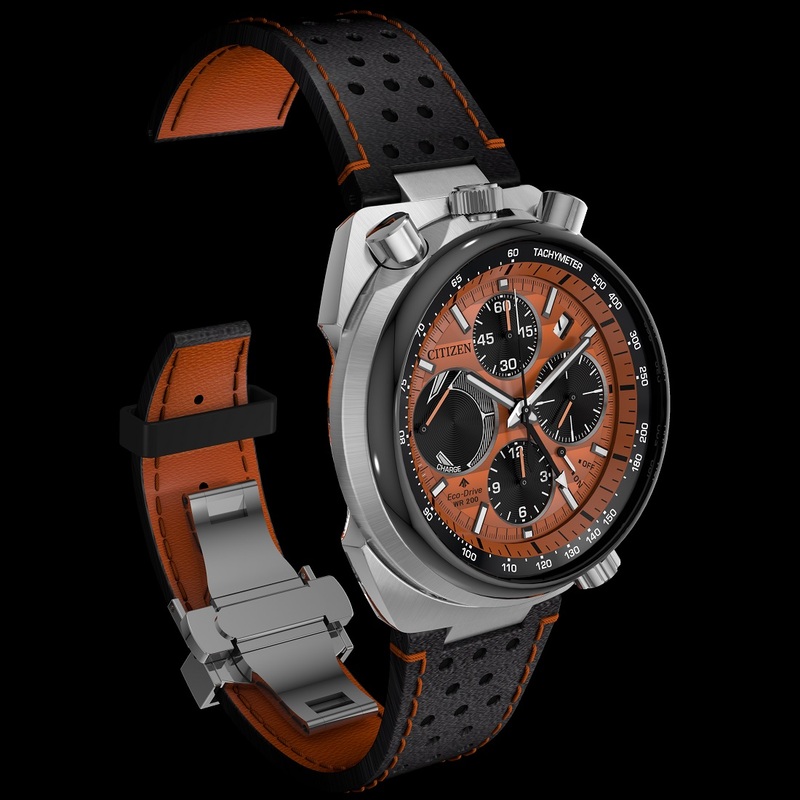 When you first look at the new Tsuno Chronograph the initial impression you get is simply that the watch is attempting to convey a lot of information at once. There are four black sub-dials located at each quarter hour. Noon is your minute counter, at three o’clock you have your running seconds, six o’clock is your hour counter, and then at nine o’clock you’ll see a power reserve indicator – the latter of which I think is the most interesting, and largely the biggest deviation conceptually from the classic Citizen bullheads. The Tsuno reissue, is an Eco-Drive watch. 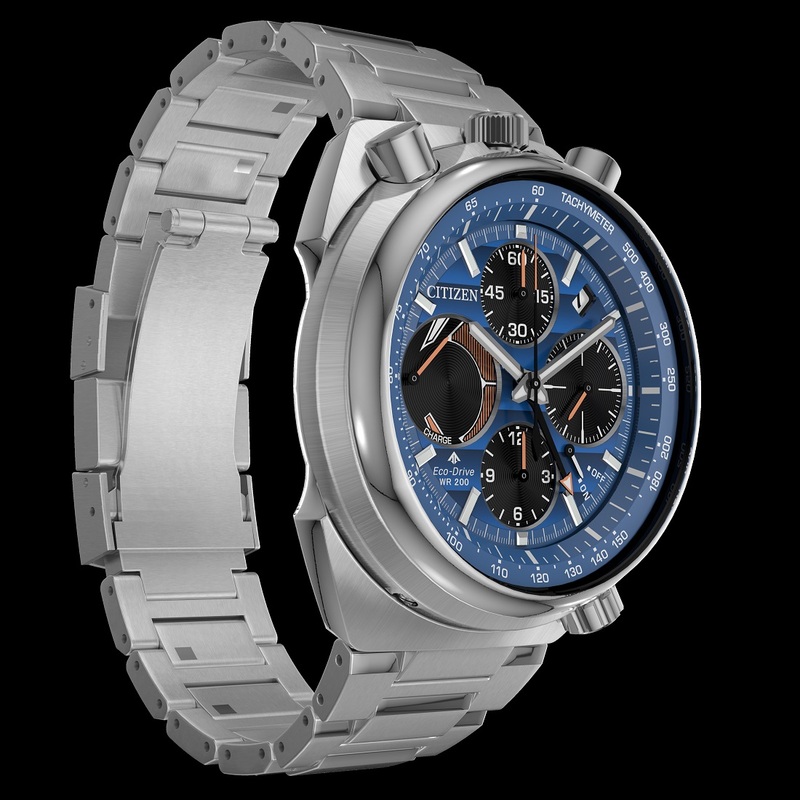 Citizen has focused a great deal of its energy on promoting its battery-less, sun-powered timepieces so it follows as a logical conclusion that this piece joins in that legacy. To contrast with the black sub-dials, the dial itself is available in off-white, a navy blue, silver, or a burnt orange. All the dials have a horizontal striping texture across them adding some dimension. The hands of the watch are lume filled, with additional lumed markers at the hours. You also have a date at 2 o’clock, which to me feels a little…vestigial? I love the symmetry of the day/date complication on the original Challenge Timers, and would have preferred that consideration over perhaps the power reserve. The steel case, in my opinion, is where Citizen put a lot of effort and it shows. With a polished bezel neatly cradling a tachymeter scale, it transitions into a radially brushed ring. The lugs also have some directional brushing on them. All this to say it appears that Citizen looked back in their archives and tried to honor the tradition of case finishing that was present during the original Challenge Timer days. That is, up until they decided to use integrated lugs for the strap. While not a deal breaker for some, the limitations of strap options could pose a problem for this model. The watch measures in at 45mm making this larger than the traditional Challenge Timers, and will most likely command a dominant wrist presence. The chronograph pushers, as the “bullhead,” name would suggest are at the top of the case, as well as a crown at noon, and an additional crown sitting at 5 o’clock. The Citizen Tsuno Racer also boasts a healthy 200m of water resistance.